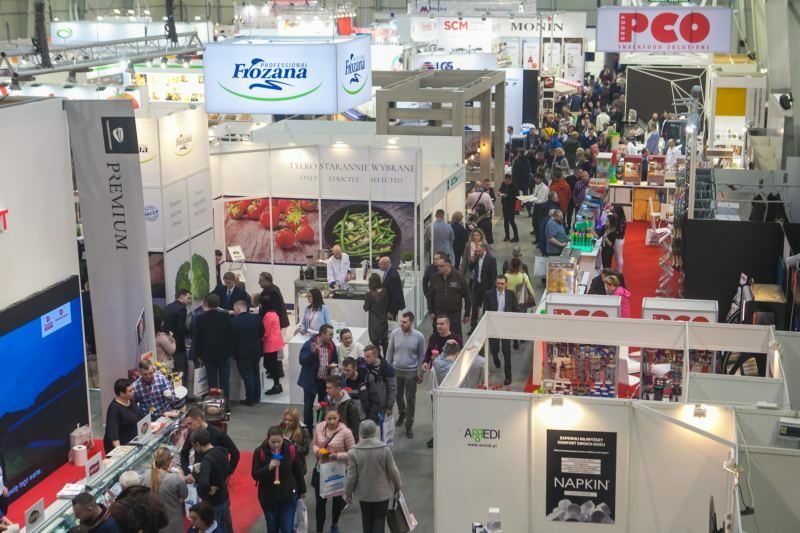 22nd International Food Service Trade Fair EuroGastro and 11th International Hotel Facilities Equipment Trade Fair WorldHotel were visited by 19,117 people between 21 and 23 March. 268 exhibitors from 20 countries were presenting their products. Once again, the marriage between EuroGastro and WorldHotel has proven to be extremely successful. Representatives of gastronomy and hotel industries have learned about the latest market trends and participated in interesting trainings. Another attraction were cooking competitions organised by known and appreciated chefs, numerous tastings and a broad selection of accompanying events. “The expo is a great place to present our new products” – says Mieczysław Kozłowski, president of Komat company – “We value its flexibility and readiness to develop joint solutions. This year, we are promoting fresh breakfast buffet – it cools and humidifies dishes, helping to keep them at the right temperature and preventing from drying – and a mobile exhaust which clears the air from grease and smell”. An Italian company TECNOINOX offering professional kitchen equipment has returned to the expo to solidify its position on the Polish market. “To our customers, we particularly recommend the TAP convection-steam oven and MOSAICO line” – says Martina Giacomini, sales director. Chiara Tonon from marketing adds – “We have invited here our salesmen, consultants and end users. We are particularly satisfied with the turnout of the latter”. and a full activity log. In case of any troubles, customers receive notifications to their telephone, tablet or computer” – explains Marcin Wajda, marketing and PR director – “Once again we are at the expo and we can still see enormous potential in it, we appreciate the quality of organisation and, what’s most important, it brings us quantifiable benefits”. Walk-in freezer produced by INSTANCO, which belongs to DORA METAL group, turned out to be a huge success. “Its customisation and configuration options to fit specific needs, as well as short waiting period make it a very sought-after product” – says Jacek Polcyn, company president – “It is also important that it is a Polish product. We do not treat the expo as a place for making sales, but rather as an opportunity for practical presentation of our equipment and image building”. At Frigomat’s booth, the visitors could try excellent ice-cream. These were a part of promotion for an on-site ice-cream production line. “GX series equipment meets the expectations of our customers, who seek modern, but also simple solutions which are easy to implement. This is where we want to reach our customers and we present selected products from our rich offer of professional ice-cream parlour equipment at EuroGastro, which keeps delivering” – says Piotr Boba, sales manager. M.I.L.-System, manufacturer of quality furniture, is celebrating its 25th anniversary this year. Its president, Mirosław Idzikowski, points out that – “We have been with the expo basically from the beginning, it is a key element of our marketing, practically expected from our customers. This is the best industry event in Poland. This year, we are mainly presenting our new product – hotel furniture manufactured in the glue-less contouring technique, which increases furniture endurance and makes it waterproof”. MILOO HOME mixes attention to the design and a variety of styles with high quality of materials and careful execution of every detail. Marcin Liśkiewicz, export manager, leaves no doubt as to the need to be present at the expo – “We exhibit in order to present the best products in our offer, to obtain new customers and see first-hand what our competitors are offering. The expo is incredibly important to us, because it allows us to better understand the market needs”. ETNO CAFE booth was attracting attention with coffee, and something else. This local Polish company focusing on brand and quality, is much more than just an artisanal coffee roasting plant. As pointed out by Hamda Trade Sp. z o.o. sales director, Marcin Rusnarczyk – “We are in 14 locations throughout Poland, and are planning on increasing this number to 20 by the end of the year. We are the first manufacturer of Cold Brew Coffee in Poland. This natural energy drink is made by macerating coffee in cold water. EuroGastro fair is a perfect place for us to create recognition for this product”. We cannot forget about Kenyan booth, where the representatives of this country invited to a visit, with broad smiles and natural cordiality. “Our role is to promote the consumption of Kenyan coffee in the country and abroad” – explains Shadrack Oyngi. Fellistas Loote adds – “Our coffee is imported to Poland primarily through German middlemen. We want to facilitate the creation of direct sales channels. Kenyan embassy in Poland recommended that we participate in this expo, and we have high hopes attached to it”. Selgros Cash&Carry and Transgourmet have invited to live cooking presentations and tastings of dishes prepared by chefs of the National Representation. “We present original cuisine and the latest culinary trends, performed by the best chefs in Poland” – said Cezary Furmanowicz, marketing director. Aleksandra Dudka, Strusia Kraina & Mobax company owner, recommended ostrich meat at the expo. “It is an exquisite delicacy, valued for its properties beneficial to health” – she praised ostrich meat – “The production is ecological, and the meat is very tasty. It is similar to beef, but much more delicate and sweeter, with a distinctive gamy note. It is our first time at the expo, but certainly not the last. There is a lot of interest in our product. It goes to show that Poles are bold and seek new flavours”. SCM Sp. z o.o. is the exclusive importer of Monin and Vitamix in Poland. Their expo booth caught the eye with colourful lemonades made on the basis of Monin syrups, placed on special carts which can be put almost anywhere. “EuroGastro is a perfect place to present our newest products” – says Robert Padiasek, sales director – “We also promote Latte Art Monin marker pens, not just for baristas, but for everyone who, like a barista, wants to create unique decorations on coffee foam. And finally, the dessert 2 in 1 – coffee served in a non-soaking wafer with chocolate icing”. CHEF Culinary Cup has been organised by Nestle Poland S.A., under the patronage of Jerzy Pasikowski, who was also the head of the jury. This year, the competition had an international edition, giving professional chefs a great opportunity to present their culinary craftsmanship. The key element of finalists’ dishes were the products of new CHEF brand, created by chefs, for chefs. 10th jubilee edition of Robert Sowa’s competition “Kulinarny Talent 2018” was prepared on a grand scale. Twelve dishes were evaluated by a professional jury: Jerzy Pasikowski, Wiesław Bober, Kurt Scheller and a participant of the Polish edition of “Top Chef” – Dawid Łagowski as well as the star-studded tasting jury: Grażyna Wolszczak, Hanna Lis, Joanna Racewicz, Agnieszka Hyży, Filip Chajzer, Andrzej Sołtysik and Rafał Maserak. The main theme of this year’s edition was British lamb haunch chop with bone. As a part of 13th Festival of Greek Cuisine organised by Theo Vafidis, chef teams from throughout Poland prepared original dishes using authentic Greek products. The dishes were rated by an international jury, divided into the professional section: Jerzy Pasikowski, Giancarlo Russo, Robert Sowa, Artur Świerżewski, Kurt Scheller, Mltos Karoumpas, Tasos Protopsaltis, technical section with Michał Markowicz and Patryk Kotarba, and the star section: Łukasz Nowicki, Zygmunt Chajzer, Tomasz Kozłowicz. 10th Coffee Olympics®, organised by Apro Trade / Coffee Academy and MT Targi Polska has stirred a lot of emotion, and baristas were competing in front of a full audience. Just like at the Olympics, competition included different disciplines, some of which required more concentration, such as “Caffe latte and macchiato art”, and some – lightning reflexes and swift action, such as “Timed espresso”. Those who did not succeed and anyone willing to compete in the future could learn how to prepare for the competition during a lecture by Agnieszka Rojewska “How to win the Barista Championship”. Tomek Obracaj of Tom Caffe took everyone on a coffee trip around the world at “60 minutes around the world – cup tasting”. He also explained the, not so simple, issue of purchasing coffee during a seminar “How to purchase raw coffee – international trade rules and logistics”. Guests from the UK shared their secrets for roasting coffee in a way that enhances its flavour during a lecture “Coffee roasting secrets – Maximising flavour through roasting”. Coffee business creates opportunities, but also threats. These could be discussed during the session on “How to create a cult café” or a presentation on “Mistakes to avoid when opening and managing a café”. Wine rePublic company, authorised representative of the largest wine-making school, Wine&Spirit Education Trust in London, has organised a Wine Olympics. For the entire day, participants could test their theoretical and practical knowledge about wine. Enthusiasts of this noble spirit could square against professional sommeliers and wine traders. The most interesting element of the competition was the practical part – blind-tasting of wines from around the world. In addition to the Wine Olympics, a series of seminars took place, the most popular of which was the “Riesling spectrum”, paired with tasting of young and old, sparkling, dry and sweet Rieslings. The seminar “Mastering Garnacha, new face of grenache” explained the secrets of this red strain of grape, whereas presentation “Why glass matters” convinced that aside from wine, it is also important what it is served in. How to rate wine was the subject of seminar “Organoleptic assessment in wine tasting – help or hindrance?”. Wojciech Giebuta, sommelier and wine journalist, conducted the training “Wine in restaurant” organised by Czas Wina publishing house; during the training, he taught how to compose a wine menu, properly order, store, exhibit, margin and promote wines. A series of trainings for hoteliers included the issue of new regulations on personal data protection (RODO), organising work in a hotel, including effective motivation and management over the team in selling hotel business and the issues related to selling a hotel business. A lot of practical knowledge was waiting to be learned by restaurateurs and investors who are just thinking about managing a restaurant. The financial aspect of gastronomy was discussed, including profitability analysis, motivational systems for employees and food cost control, during trainings: “MADE PROGRESS in FINANCE – YOU (don’t) COUNT, YOU (don’t) PROFIT”, “Modern cost management – budgeting in gastronomy” and “Restaurant without employee turnover – personnel management in the 21st century”. There were also workshops on effective sales, marketing and customer satisfaction – “Be 3 steps ahead and make money”, “Sales and marketing in gastronomy”. Conference “Senses – how to direct them so that your restaurant truly amazes the guests?” was very popular. In the competition for the Best product for hotels, “THE BEST OF WORLDHOTEL 2018”, the winner was “Digital reporting card” by LSI Software. The second place was awarded to architektwnętrz.pl company for “Zielone sznury” (Green ropes). The third place went to M.I.L.-SYSTEM for its “Hotel furniture manufactured in the innovative glue-free technology – Laser Edge”. In appreciation of his years of collaboration, Kurt Scheller received a Grand Prix from Urszula Potęga, president of MT Targi Polska. Thanks to everyone who has made this year’s fair such a fantastic event. We would also like to invite you to the 23rd edition of International Food Service Trade Fair EuroGastro and 12th International Hotel Facilities Equipment Trade Fair WorldHotel, which will take place on 27-29 March 2019.